Image Description from historic lecture booklet: "The geisha or singing girl to the "Western" mind fills out the romantic ideal of modern Japan. To the native she is simply a sublimated waitress with dancing and singing trimmings, but she is also a chosen vehicle of Japanese romance. Visions of her dressed in showy silken robes waving a large fan, her black hair marvelously coifed, a fixed smile on her face and moving in rhythmic steps with a special flowing elegance of gesture, rise before those who have seen her at her high functions. 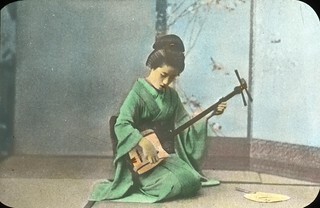 Ever to the accompaniment of the tinkling strings of the of the samisen and the full beat of the tsuzumi that picture comes back to the foreigner as the flower of his reminiscence of Japan. "